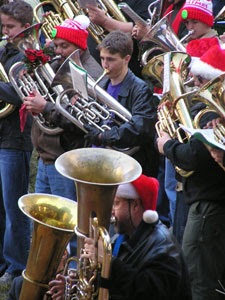 Dallas celebrated its twenty-ninth annual Tuba Christmas at noon Friday in Thanksgiving Square. And we were there! One hundred eighty seven tubas and euphoniums participated, with hundreds and hundreds more spectators crowding the small park in downtown Dallas. The weather was glorious, with a clear blue sky, bright sun peeking around and between the skyscrapers, and temperatures just chilly enough to make the hot cocoa welcome. John, with borrowed tuba, was in the front row with his friend Chris. John missed the last two Tuba Christmases while traveling to Northwestern University in Chicago and family Christmas celebrations in Wisconsin.